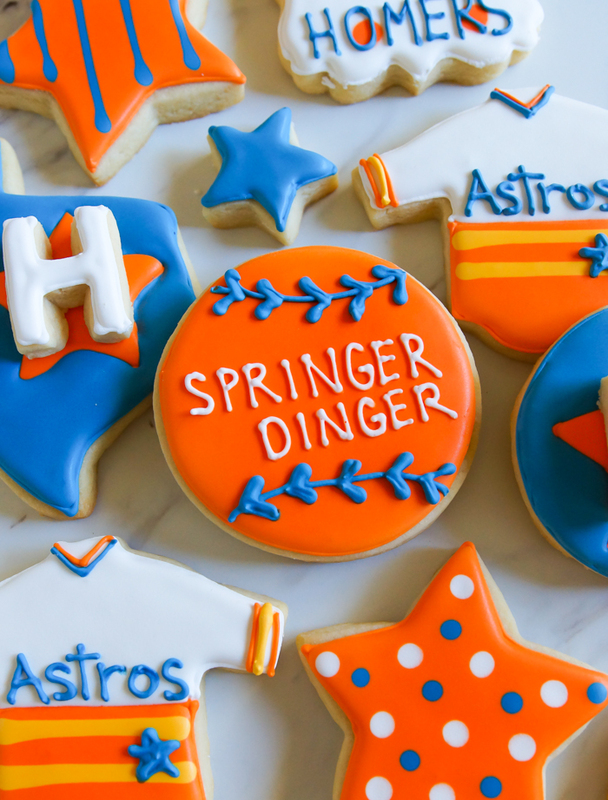 Well, our house is ready for the 2018 ALCS...if by ready you mean, have a stash of 3 dozen Astros-themed cookies. 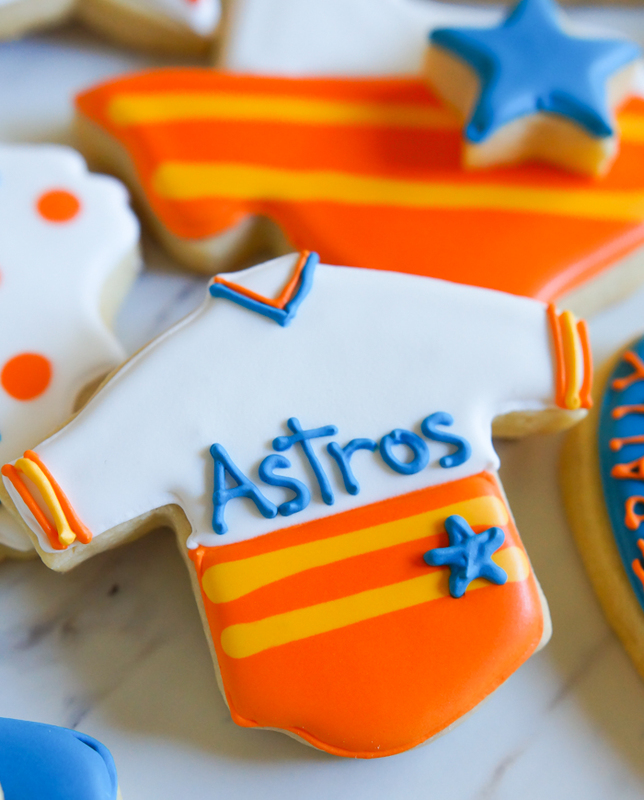 You might have to be an Astros fan to "get" some of these cookies. I'll talk you through the colors and shapes used for them, though. Then, the Astros flirted with a change in color...what were they thinking...but it was the time of Lance Berkman (Big Puma/Elvis), Roy Oswalt, and yes, Biggio, so we forgave them. In case you missed it, the Astros WON THE WORLD SERIES last year and are about to compete in the ALCS. (Y'all this is the most sporty talk I've ever done.) You know how this goes...we needed cookies. One thing about this team is that they are SO FUN to watch. There's a joy there that is palpable. Maybe it's because I'm an Astros fan, but other teams seem...mean. Sorry, I said it. I never said I was unbiased. For the cookies, I used my go-to, never-fail, perfect-every-time cut-out cookie recipe. I cut these 3/8" thick. For the royal icing, I used my go-to royal icing recipe. 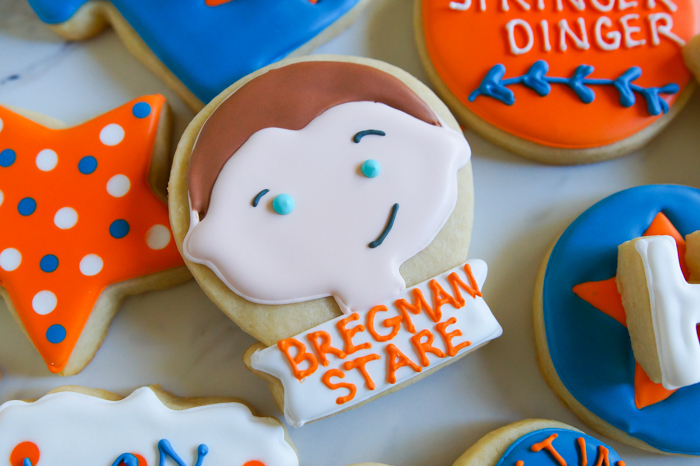 I was most excited to make this "Bregman Stare" cookie. It's also known as the "Dugout Stare." Google it...or just watch after Bregman homers in the next game. For the shape, I used Sweet Sugarbelle's Horseshoe cutter. I used a paring knife to make the bottom look a little more like a banner. 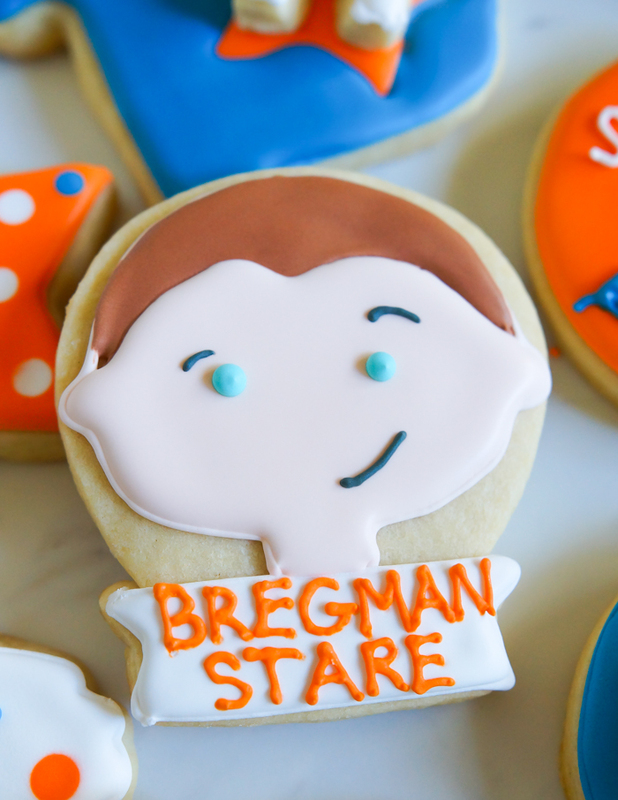 "are alex bregman's eyes blue or green"
"what color are alex bregmen's eyes"
You know what? Google DOES NOT have this answer! I couldn't tell from photos and felt very creepy zooming in on every one of his headshots. Sooo...I made them turquoise. 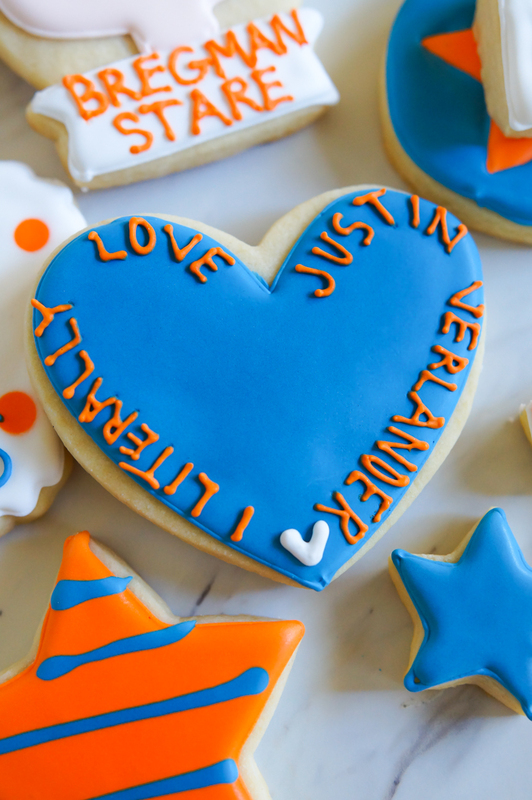 This cookie may seem like it's all about Justin Verlander (Hi, Kate! ), but it's a quote by the forever fan favorite, Jose Altuve. GEORGIE! I hope George Springer doesn't mind that I call him Georgie. George, you can call me Bridgie anytime. 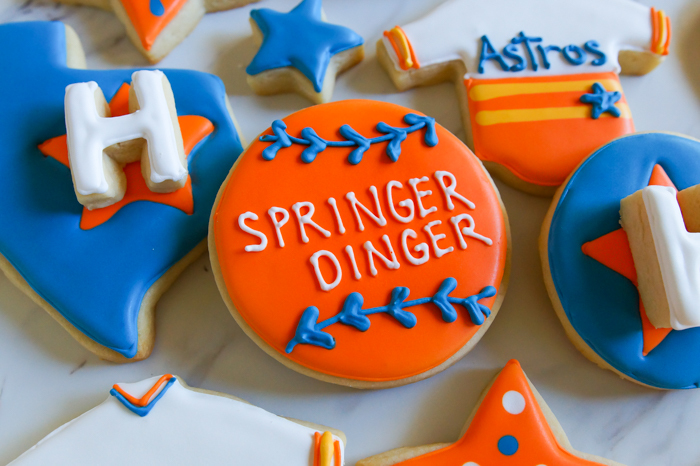 No Astros cookie set (or playoff game) is complete without a Springer Dinger. 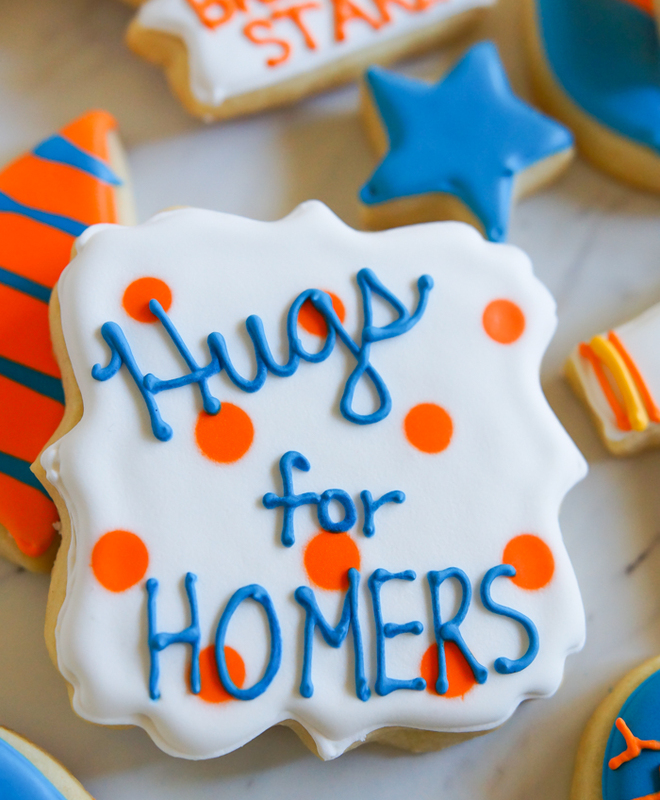 And Tony Kemp's Hugs for Homers!!! Y'all, it's the cutest ever! 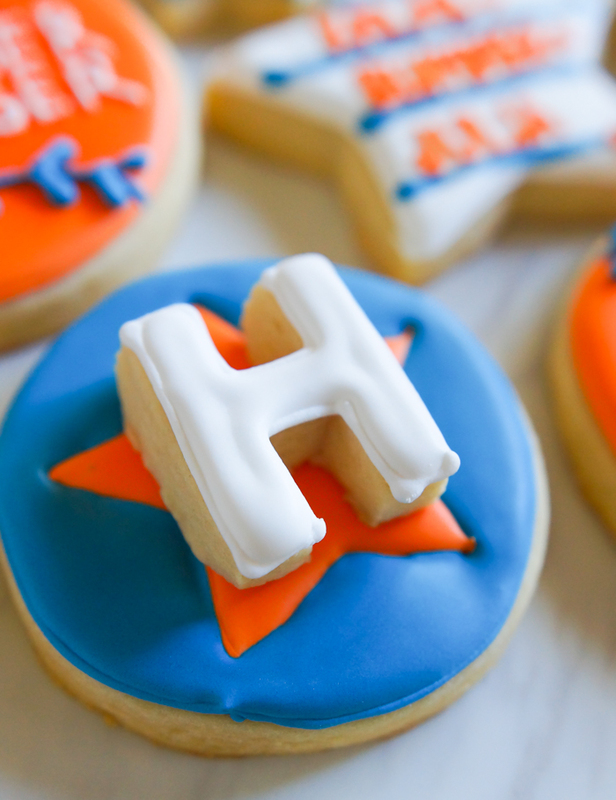 The cookies with the H's and the raised blue stars are double-deckers. You know that that means - two cookies in one! More info on making double-decker cookies here. Oh! 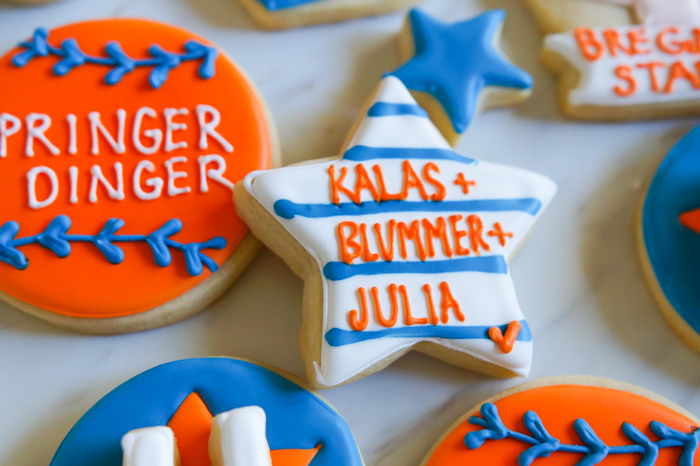 And I made a few cookies to commemorate our awesome local announcers: Todd Kalas, Jeff Blum, and Julia Morales. I really wish they were able to call the playoff games, too. They're awesome. 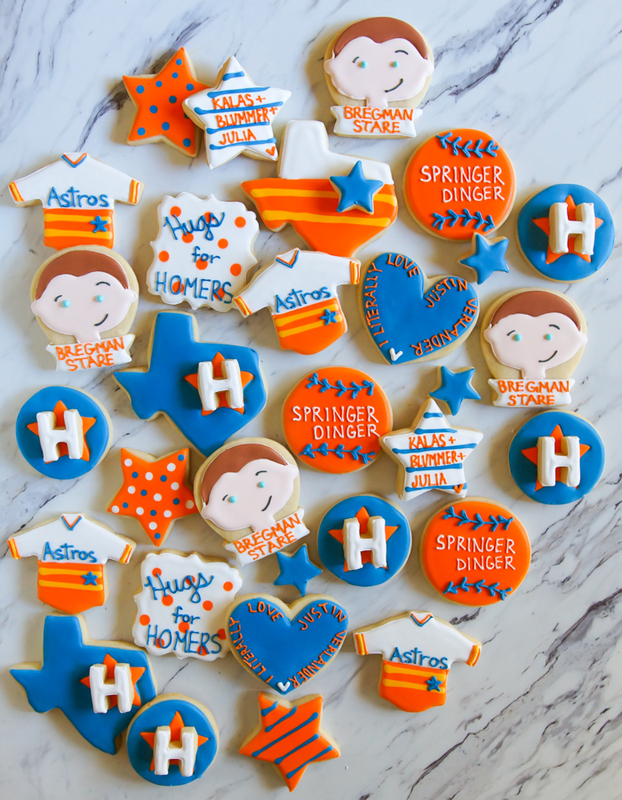 There are so many more Astros cookies I want to make: Woo!, Never Settle, Orbit (!!! 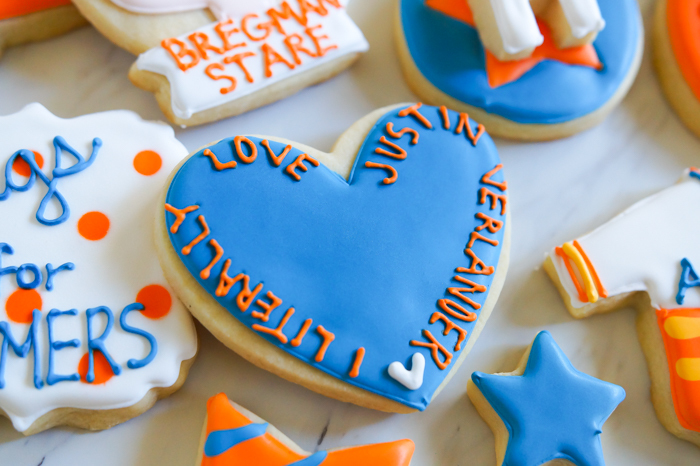 )...and cookies for ALL of the players. We love these guys. Ok, AJ Hinch and the boys...go get those Red Sox! GO ASTROS! SO neat! I am a Houston native and still live here. These are adorable! I was hoping you were going to post a link to where I could purchase :-). You would make a killing selling these here. Love these! 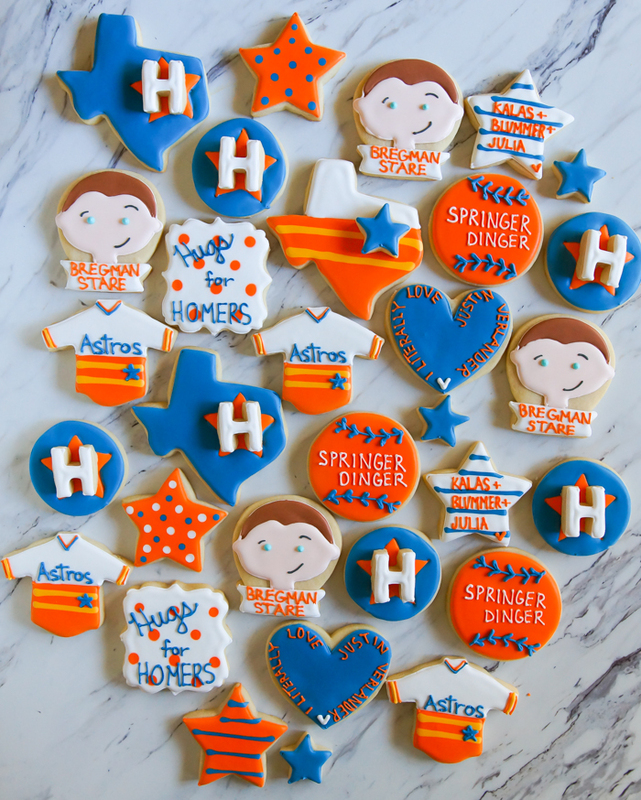 I'm from Sugar Land and we're big Astros fans too! They always look like they are having so much fun and love playing together. Go 'Stros! ♥The colors and pics are so great Bridget!! If you ever make an Orbit cookie I’ll buy 50 from you!!! �� love that green alien! 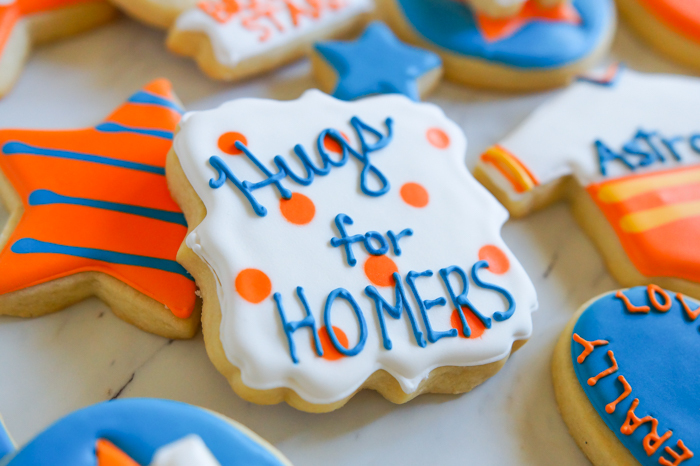 These might be some of my favorite cookies I've seen you make (and I'm a Royals fan!) These are seriously amazing!